Richard Guerra Cabral fires an Uzi 9 mm submachine gun at the Front Sight Firearms Training Institute near Pahrump on April 20. Uzi 9 mm submachine guns sit on the ground at a firing range at the Front Sight Firearms Training Institute near Pahrump. 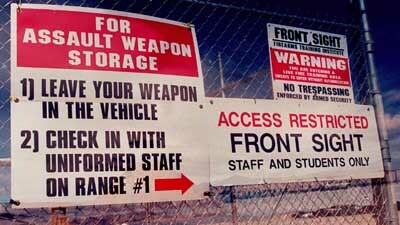 Signs at the range instruct visitors on how they can store their firearms. One of Front Sight's business niches is storing assault rifles and weapons for Californians and others who are worried that their state governments might someday confiscate their firearms. 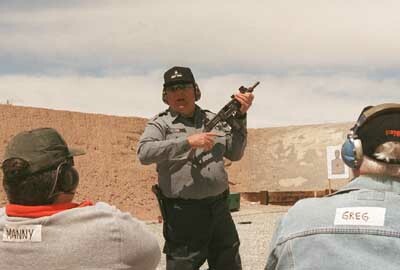 Pat Pelzer, a range master at the Front Sight Firearms Training Institute, provides some instruction on how to safely handle an Uzi 9 mm submachine gun. The class is free for most people at the planned resort community outside of Pahrump. It wasn't the gambling or Hoover Dam that brought Richard Guerra Cabral from Los Angeles to Southern Nevada last weekend. "I call it therapy," said Cabral, just moments after he pulled the trigger, letting loose a barrage of bullets at a shooting target. Cabral wasn't alone. Standing next to him at one of the training ranges at Front Sight Firearms Training Institute were an attorney from California, a school secretary from Reno, a college administrator from New York and a real estate professional from Phoenix. They all had come to get the feel of firing an automatic machine gun at the institute, located about 15 miles east of Pahrump. But this is not just another shooting range. In one of the more interesting concepts to hit Southern Nevada in recent years, the institute's founder -- California chiropractor Ignatius Piazza -- is in the process of building an elaborate, multimillion-dollar resort that's centered on shooting ranges and firearms. The 550-acre resort plan is built on the premise that 24-hour access to shooting ranges will attract law-abiding citizens and even the rich and famous to a gun lover's oasis in the desert. If Piazza pulls it off, a desert area about 4 miles off state Route 160 will be host to a $40 million resort community. "A resort that has no rival," Piazza says of his dream. "This is a resort where law enforcement and private citizens can train together and enjoy it." Over the long haul, Piazza hopes that Front Sight -- with its proposed palm trees, shopping community and school -- will do more than just train people on how to shoot a gun. Decades from now, he expects that Front Sight will have changed some of the nation's negative views on gun ownership and the Second Amendment by providing gun training to America's policy- and decision-makers. "Is it because we want to rub elbows with all those celebrities?" Piazza said. "No. We want to educate them on who the real gun owners are in this country." The idea of a resort for gun owners -- a so-called Pebble Beach for firearms -- may sound ludicrous. But considering how many states are passing more restrictive gun laws, Piazza believes he's onto something from both a business and marketing perspective. "It's a unique and very exciting idea for people who support the right to bear arms," said Alan Korwin, a co-owner of the California Gun Owner's Guide, a book documenting gun laws. 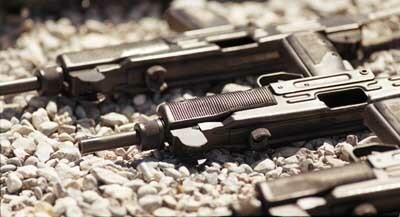 Korwin said word of Front Sight's resort plans spread quickly among the nation's gun owners. "For people who like this American pastime, the demand (for the product) is high," Korwin said. In California, owners of certain types of high-powered weapons such as an Uzi are now required to register their ownership of the firearm with the government. The vast majority of gun owners in California are not doing so, Korwin said, because they fear that registration will be followed by confiscation. "They fear the tyrannical abuse of power that is strictly prohibited by every fabric of law in this land," Korwin said. That is where Piazza steps in. Part of the Front Sight business model includes offering any gun owner who feels threatened a place to store their weapons without fear of seizure. If gun owners sign up for at least $500 worth of firearms instruction at Front Sight, they can store their guns there for free. Piazza said he first got into guns following a drive-by shooting in his Southern California neighborhood. For years, he treated guns as "art objects," and thought simply because he owned guns he was an expert. However, after taking several firearms training classes, he realized he was only a novice. Given that the vast majority of the 80 million gun owners in the nation have little or no formal firearms training, it dawned upon him that there was a need for a training institute and community like Front Sight. He chose the Nevada desert because the state is more accepting to the idea of average citizens being able to fire and train with high-powered weapons. Piazza envisions a community that can cater to a family's every need. There will be paved roads, a 6,000-foot conference and classroom area, and a pro shop. A 7,200-square-foot armory and gunsmithing facility is planned as well as a gourmet restaurant overlooking a desert vista and a lake. Also on the drawing board are a 177-acre luxury home community, a commercial center, a private K-12 school and an airstrip to fly celebrities and politicians in and out of the resort's "Celebrity Training Center," designed to train the rich and famous. Through the training center, Piazza believes he can change the opinions of the country's leaders when it comes to gun legislation. "We need to reach the opinion-makers, the Fortune 500 executives, the Hollywood crowd, the media," Piazza said. "They may be thinking they'll see Bubba and his militia buddies out here, but who will they see?" Piazza continued. "They'll see doctors, lawyers, businessmen." And of course, there will be the gun ranges. Piazza said the Front Sight Resort will offer at least 20 state-of-the-art shooting ranges where residents and trainees can shoot 24 hours a day. If Piazza's vision is fully realized, Front Sight will also have 400 yards of underground training tunnels, a SWAT tower, a repelling and ropes course and underground rescue training. Piazza has found a marketing niche. More than 10,000 people have taken the classes in the past four years, and they are continuing to come. Last week, more than 200 people were on hand for the classes. And, since the resort's inception, more than 40 of its highest memberships have been sold at a price of $300,000 each. That price includes use of the shooting ranges for life and a one-acre lot to build a house on. The endeavor has not been without its setbacks. The resort, to be built in three phases, is still in phase one. That contradicts earlier estimates by Piazza and Front Sight, which had phase one being completed by the end of last year. Piazza attributed most of the delays to disputes with the project's original contractor, Martin-Harris Construction. Frank Martin, owner of the company, said last week that Piazza has paid only $455,000 of a $2.4 million construction bill. Piazza disputes that, saying Martin-Harris caused extensive delays in the project because they did not secure the proper permits. Martin says that is simply not true. Regardless of who is right, Piazza said the dispute led to Front Sight feeling the wrath of the Bureau of Land Management and Nye County, which expressed concerns about whether Front Sight was following proper procedures to ensure permit and environmental compliance. The firearms training facility is located in Nye County, while the master-planned community is across the border in Clark County. The contractor and Front Sight are in litigation over the matter, but Piazza said he has since appeased both the BLM and Nye County regarding any of their concerns. "We are now in good standing with all of them," Piazza said. "It is not a question of if its going to be built," Piazza said. "It's only a question of when." And, even though the resort is far from finished, gun enthusiasts are coming from across the nation to train. On April 20, more than 200 people filled Front Sight's ranges for training. Some came for the two- and four-day defensive handgun classes and handgun combat master prep classes, which range in price from $500 to $1,500. 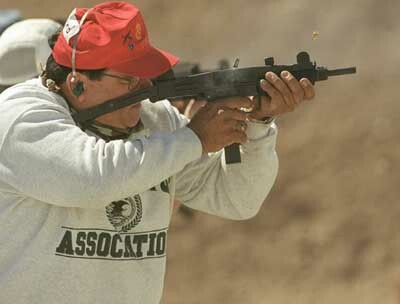 The ones who came to fire an Uzi stood before Pat Pelzer, Front Sight range master, as he rattled off safety measure after safety measure to a group of 26 students. "Bolt. Magazine. Safety," Pelzer yells out time and again, making sure they have the procedure memorized. It is Pelzer and his three other instructors who make sure there will be no safety problems when their students are ready to fire the weapon. "It's safe," said Phoenix computer services professional Jack Wilson. "It's an hour and a half before you even have the weapon with ammunition." After the safety course, the students fire the weapon on semiautomatic. It is not until eight hours later that they get to unload a full clip from an Uzi on fully automatic. "It's a kick," said Ann Morello, a school secretary from Reno, who at the urging of her husband, Rick, decided to spend a part of her school spring break firing an Uzi at Front Sight. "I didn't feel intimidated at all," she said. "There's absolutely no reason a citizen shouldn't be able to do this," said Uzi student and Los Angeles resident Manny Fernandez.